Prices subject to change as editions sell out. 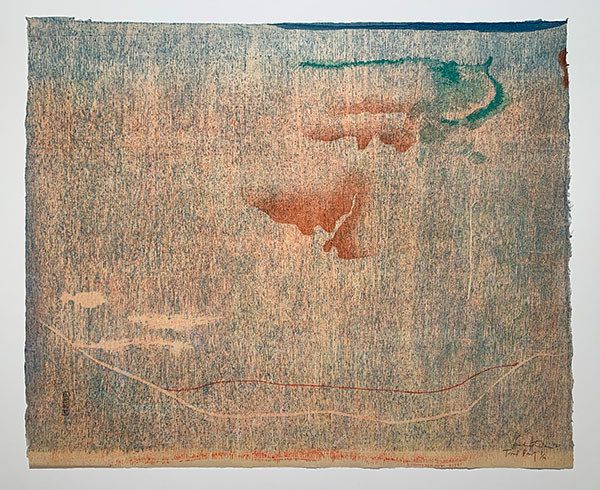 In the six prints from the Tales of Genji series, Frankenthaler has worked with master printers at Tyler Graphics to create intricately carved wood blocks printed in as many as 53 transparent colors on 47 x 42 inch sheets. The transparent inks reveal radiant colors when printed on specially tinted handmade papers. 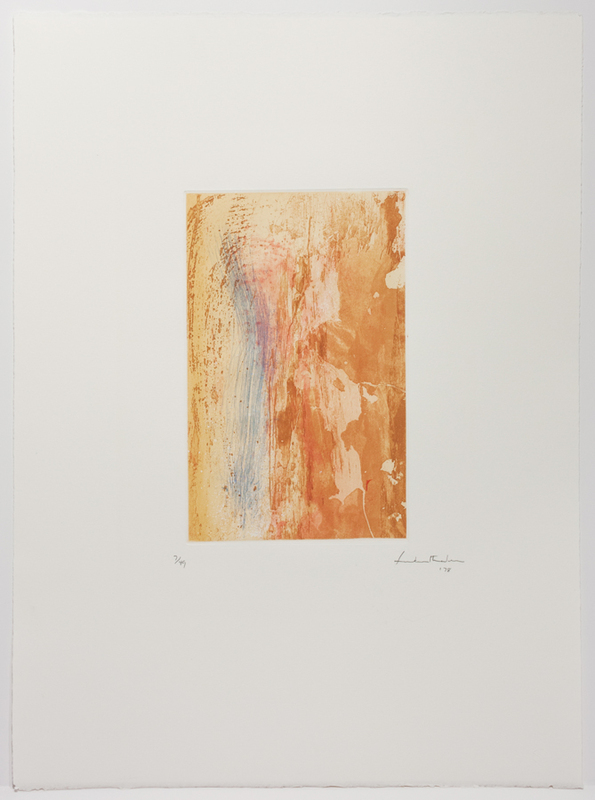 Titled after an 11th c. romance considered to be the world's first novel, Frankenthaler's series is inspired by the watercolor-like effects of the numerous Japanese ukiyo-e woodcuts that have been created in response to this passionate tale. In these over-sized images, Frankenthaler has distilled the best of her stained imagery, her erratic linear elements and her mastery over some difficult color combinations. Her mark making is often random but never arbitrary. Nuances in color and delicate changes in texture has always been an important aspect of Frankenthaler's working methods. Whether in her paintings, works on paper, or as seen in these prints, her spontaneous efforts are held in check by her rigorous demands for beauty, clarity, and an ambiguous expressive relation to the natural world. When printed on cotton handmade papers, the many thin veils of color, which are applied layer upon layer, achieve a depth of painterly resonance. The grain of the wood stands out in many of the prints, while in others the fluid look of her early stained painting is revealed. This delicate layering of imagery allows Frankenthaler's especially poetic use of color and form to shine. As Ken Tyler describes: "Since the goal (of the Genji prints) was to make a woodcut with watercolor effects, we employed a hydraulic press to squeeze the inked blocks into the thick and absorbent cotton handmade paper, purposefully causing certain colors to bleed." 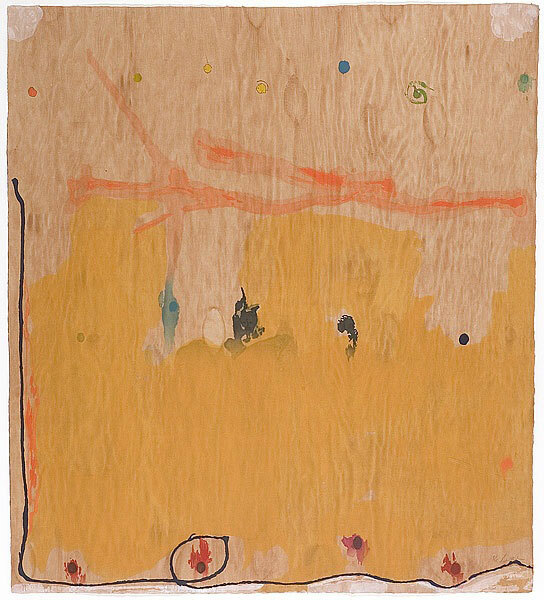 Frankenthaler was born in New York in 1928. Trained at the Dalton School, and later at Bennington College and with Wallace Harrison and Hans Hofmann, she received her BA from Bennington College in 1949. She very quickly became a highly recognized and influential member of the second generation New York School and, as one of very few female members of that school, held her own with the men in terms of scale, gesture and productivity. She was married to fellow artist Robert Motherwell from 1958 until they divorced in 1971. 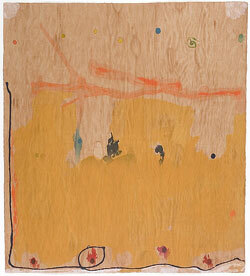 Frankenthaler taught at Harvard, Princeton, Yale, and New York universities. Frankenthaler was awarded the first prize for painting in the Paris Biennale de Paris in 1959 and has received numerous other awards and honors. She has shown regularly in galleries and museums around the world since the late 1950s and has work in many museum collections around the world. Her one-person exhibitions include The Jewish Museum (1960), Whitney Museum (1969), Metropolitan Museum (1973), the Seattle Art Museum (1975), the Solomon R. Guggenheim Museum (1986), and the National Gallery of American Art, (1993). In 2001, the artist received the National Medal of Arts. She had a home and studio in Darien, CT. She died December 27, 2011. 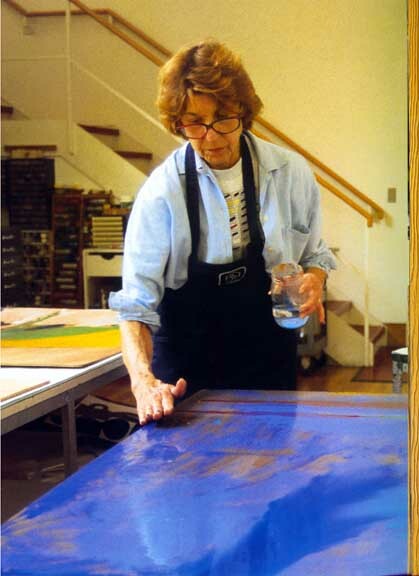 When Helen Frankenthaler died in December 2011, she had established herself as a significant and innovative painter and printmaker. 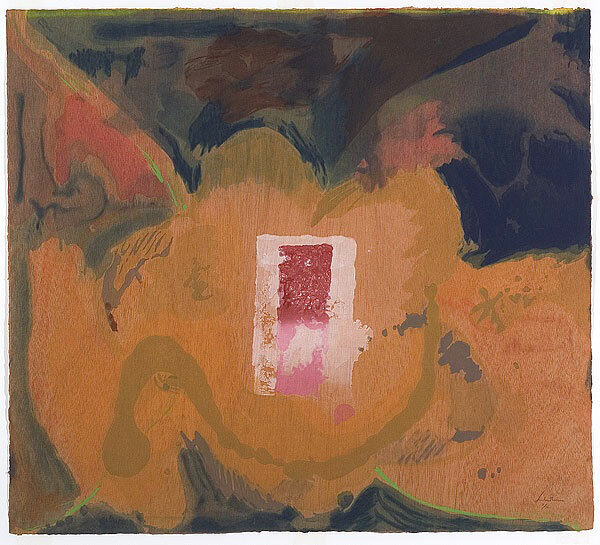 Frankenthaler's prints combine the artist's trademark use of rich colors, interesting papers and the ambiguous abstract imagery which propelled her to the forefront of the New York School in the 1950s, and later the Color Field painters in the 1960s. One of the defining artists of 20th century American painters, Frankenthaler was concerned with developing a close relationship between image and surface and with the specifics of the medium of paint. One of Frankenthaler's favored techniques, staining the canvas with the pigment and allowing the different layers to show through, has become a quintessential characteristic of contemporary painting. Her prints often followed this idea, creating layers of color in a variety of printing techniques, often using several distinct processes in a single print in the expression of a particular feeling or mood.